The 2017 Toyota RAV4 sitting in front of me covered in bugs (turns out New England has a lot of bugs) certainly did not fit the archetype of what I thought of as a “rally car.” Populating the roads running along the rolling hills of Maine and New Hampshire I had spotted the predictable ones—blue Subarus, sticker-covered 911s, Mitsubishi Lancers, and even a great-looking orange 280Z—which made Toyota’s stout family crossover stand out even more. Toyota seems to think maybe the problem was that we were driving it wrong. So they invited us to the Team O’Neil Rally School to give us a taste of what the RAV4 can do when called upon. They gave us a trio of stock RAV4s, enhanced only with mud flaps and skid plates to protect the vehicles, and LED bars, to give the decidedly un-rally-like CUV a rally feel. 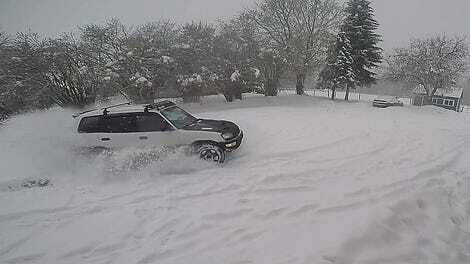 Not that the RAV4 needs to be fun. The RAV4 nameplate has existed since 1994 and can be considered one of the granddaddies of the crossover craze, a sort of Patient Zero for the spreading sickness that is killing sedan sales left and right. The current generation has been around since 2013, with a mid-year refresh in 2016. It’s a top-seller for Toyota, despite what rappers have to say about the RAV4. Panning from auto journalists also doesn’t seem to do much to stem the tide of RAV4 sales, which hit 352,000 vehicles in 2016. The RAV4 comes in five trim levels; LE, XLE, SE, Limited and Platinum. No matter what trim level you opt for however, you’re still stuck with the same automatic gearbox and 2.5-liter four cylinder good for only 176 horsepower and 172 lb-ft of torque. Toyota claims 23 mpg in the city and 30 on the highway, though when you’re hooning, fuel is not the first thing on your mind. So here’s the thing: I have never rallied in my life and I’m very lucky to have been with such excellent instructors my first time out. I’ve never owned particularly dirt-worthy vehicles and have a persistent fear of deer (the leaping menace of all Michigan drivers). Basically I’m a city slicker who sees death, or at least a messy car crash, lurking behind every tree. But since a RAV4 is fairly roomy and stable with a small CUV’s 3,400 pounds behind it that fear dropped away, and suddenly I was chewing up the track with the best of them. Yes, learning how to left-foot brake on crazy rally courses might be fun in most cars, but the RAV4 proved surprisingly able at every turn. Here I found myself pulling a few solid Scandinavian Flicks, which our instructors doubted could be done in the RAV4 due to its high center of gravity. But spinning the wheel and stomping the brake still produced an oh-so-satisfying controlled fishtail around sharp turns. Clavey found the steering anemic. Pro tip: if you slide into every turn, you don’t need to worry about that. Okay, so the engine is a pretty boring four-cylinder with a 0-60 time of 8.2 seconds. That’ll get you from stoplight to stoplight okay, but in a true competitive scenario such a lag has obvious drawbacks. But it’s a tortoise and hare situation. Those fast guys can tear up the track all they want, but if they slide off into the woods or eat it on a rock, it won’t matter how fast they are. Those are issues the RAV4 is particularly well adapted to handle. In rally, toughness is just as important as speed. The SE trim, which became available during last year’s refresh, offers paddle shifters to give drivers that sporty feel. But really, with a car this lacking in quickness, you’re fine getting by with the automatic transmission. The shifters just don’t make enough of a difference to justify their existence on the steering column. Toyota is clearing aiming for the elusive affordable “sporty” compact SUV, but the RAV4 is just too slow and heavy to really be considered a contender. While Toyota is proud that they are racing a “stock” RAV4, if they ran the car with the 500 extra pounds the production model comes with, the drivers would be standing on the gas pedal the entire race and still be left in the dust. What the RAV4 lacks in quickness it makes up for by digging its well-manicured claws into the road. The SE comes with a stiffer suspension and can hold onto gravel better than some of the faster and slipperier cars on the rally circuit. But while the meatier suspension made the off-roading portion of our time with the RAV4 thrilling—allowing the CUV to tightly hug the corners at speed with little sway—it was a noticeably rougher ride during basic driving on smoother roads. Every bump rattled the occupants. Rest assured, it comes with every bell and whistle a buyer could ask for in their CUV; a large, friendly center touchscreen, a great suite of JBL speakers, bird’s-eye view cameras that give drivers a 360 view, parking sensors, adaptive cruise control—the works. It’s comfy, roomy, reliable and functional; the type of thing you look for in a good family CUV, which makes it’s roll in rally racing even more surprising. 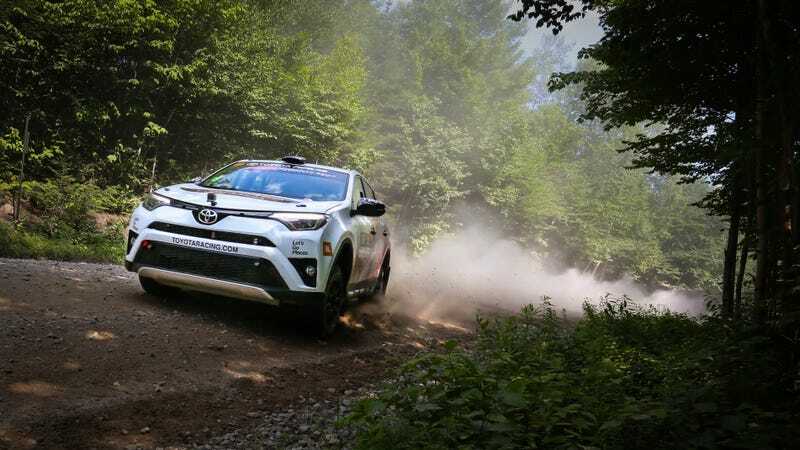 The two people who aren’t the least bit surprised by the RAV4’s capabilities were driver Ryan Millen and co-driver Rhianon Gelsomino, driver and co-driver of the RAV4 Toyota is running in multiple rally championships this year. Last year, Millen with his co-driver and wife Christina Fate competed in 12 races and won the Rally America’s Rookie of the Year award, the NASA Rally Sport National Championship and they earned second place in the 2016 National 2WD Championship. This year, they aimed even higher. Fate left the co-driver position after becoming pregnant and Gelsomino was hired to filled her position. Both Millen and Gelsomino come from diehard racing families and have spent their lives in the sport. Rod Millen (brother of Steve, father of Ryan and Rhys) is a legend in racing who competed in rally, off-road racing, hillclimbs and won several worldwide championships. Gelsomino also comes from a family of motorsports athletes and has been competing for years. She founded a co-driving school where she trains the next generation of co-drivers in her detailed and meticulous system of note-taking. The pair cleaned up the 2WD class this year with six first place wins while running what is, essentially, a stock RAV4. The pair particularly like the toughness of the RAV4, and the excellent ground clearance. Gelsomino said she and Millen work with the RAV4’s high-centered weight to keep the RAV4 going. But just how stock is their car? Sure the rear seats are gone, the suspension has been slightly enhanced to handle rough rally roads, and there are a few extra parts thrown in (like places to bolt your helmet to the roll cage and, of course, a whole roll cage) but the car Millen and Gelsomino race in is essentially the car you and I mere mortals can buy from a dealership. While your regular Joe isn’t going to scoop 500 pounds out of the interior and install a roll cage, everything else is direct from the factory. “It was my direction to keep the car as stock as possible. I know how much engineering goes into it.” Millen said. We got to see just how stock the car is first hand. While taking journalists on hot laps in the woods the evening before the start of the North East Forest Rally Millen’s racing RAV4 died. Thanks to some very big rocks chewed up by the car running the same track over and over, the main engine control unit took a beating. The car wouldn’t start. Luckily, we were being shuttled around the backwoods of Maine in production RAV4s, the kind you might see outside of a middle school soccer meet. After some hasty roadside surgery, Millen’s race car had a brand new ECU ripped from our production street vehicle. They then went on to win the 2017 American Rally Association’s 2WD class championship the very next day. In August, Millen and Gelsomino knocked off their sixth straight victory with the Ojibwe Forests Rally. Most people who attend rally races are fairly young. They are also the kind of people who couldn’t pick up the RAV4’s fascia from a line up if it mugged them in a well illuminated parking lot. Naturally, getting the RAV4 in front of this crowd is good for Toyota. The car certainly stands out during a day of watching the usual suspects. When I got home I thought more about the RAV4. Maybe we had been too harsh on it? Perhaps it deserved another turn around the block in a grocery-getting scenario, I figured. I picked one up to experience the RAV4 as a daily driver and it was… fine. I appreciated the fat suspension on the rough roads back home, and the large cargo space—38.4 cu. ft—was nice when heading with friends to the beach. It’s a trusty, safe, sensible crossover, like many, many other modern cars. It didn’t keep me up at night fantasizing about curvy roads and no traffic. There are definitely options out there on the market that are friendlier to your wallet than the RAV4 too, both in terms of price and gas consumption. The RAV4 isn’t a bad car. In truth, there aren’t a lot of really bad cars left out there anymore. A car is only as useful or as enjoyable as you find it to be. When it comes to the RAV4, it seems like the most fun to be had in this vehicle is definitely on a rocky forest road—if you’re willing to try it.